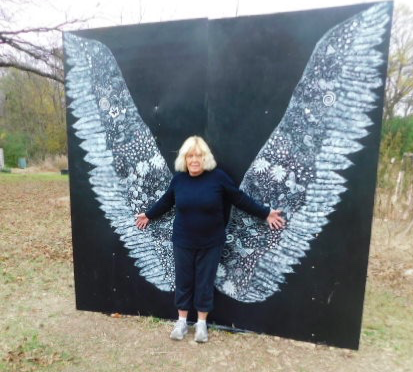 WINGS IN THE GARDEN - a participatory art installation in the Garland Community Garden -- Do something out of your box, even if it feels silly. Many of us are stuck in belief systems that no longer serve our needs. We've heard it all before: "Take new paths. Step out of your box. Do things you've never done before. Talk to someone with a different worldview from the one you hold. Take the road less traveled, Read an author you never hear of. etc." And it's still all very good advice. When we surround ourselves with only those who agree with us, we limit the development of our intelligence and vision and our potential to fully develop as human beings. Rigor mortis begins to spread in our brains and our thoughts become crippled as our inability to think in new ways deepens. If you have trouble getting started, think of some emotionally charged topic for you. For example I believe that all white people______ or I believe that all black people______ i believe that all Republicans __________ I believe that all Democrats___________. There are other ways to jar oneself out of an ossified belief system that no longer serves you or the people around you. Allow a few people with different world views into your life. Have conversations with them. Make a conscious effort to seek out exceptions to one of your deeply held beliefs. When a nation has a leader who surrounds himself entirely with only those who agree with him (or who at least say they agree with him), then people get the “my way or the highway” leadership of a self-absorbed dictator. Cases in point: Kim Jong-un doesn’t allow anyone to disagree with him; nor does Putin; nor did Franco; nor did Hitler. Unfortunately our own President seems to follow their example as there is a long string of people he has appointed, only to fire when they disagree with him. Another name for this kind of “patriotic” thinking is Nationalism. If we are so busy glorifying our nation we may become blind to the part our nation's leadership and foreign policies of the past played in destroying another country and that perhaps reparations are owed. For example, read the history of US military meddling in the politics of Honduras, Guatemala, and El Salvador. We are not innocent bystanders in the destabilization of these nations. Our leadership has been working overtime at it for 50 years up to and through today. For example, Soto Cano Air Base (commonly known as Palmerola Air Base) is a Honduran military base 5 mi (8.0 km) to the south of Comayagua in Honduras. It houses between 500-600 U.S. troops and is also used by the Honduran Air Force academy. What the USA has done in these Central American and South American nations is just another version of what we did to Mexico by destabilizing their corn market in the 1990’s with our heavily subsidized corn commodities and NAFTA trade agreement that drove 2 million Mexican farmers out of the market and into the maquiladoras and also illegally into the USA. Whose fault was that really? And again people do not wake up one morning, put on their flip flops and decide to walk over a 1000 miles away from all they’ve ever known as home unless they are truly faced with what they believe to be a life/death choice. Think about it from a personal view. What would it take for you to pack up, leave your home and travel over 1000 miles practically barefoot to a place you’ve never seen before and perhaps don't even speak their language? These people are at our gates because they feel they have no other alternative. If we slam the door in their faces, our nation takes one giant step backward from what it means to be human. This is not my idea of how Americans are supposed to act. Americans need to unfreeze their thoughts and open their hearts. Our nation has a food sustainability index of 124% . This translates that we have enough food to support 24% more than our current population. In numbers, this is approximately 80 million more people. In addition, we need young immigrant workers to help support our aging population and declining birthrate. We need to start thinking and turn off the automatic pilots of our false belief systems that are supported by cliches, campaign rhetoric and what in many cases amounts to hate speech. Our best interests as a nation can indeed be tied to the best interests of the migrants at our gates in Tijuana.